This course assumes very little familiarity with Edge Animate CC. 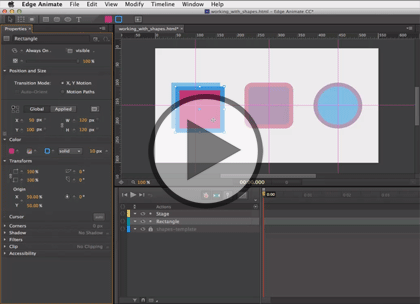 This course is part of a 5 part learning series; Edge Animate CC: Introduction; Edge Animate CC: Shapes and Text; Edge Animate CC: Graphics; Edge Animate CC: Actions; and Edge Animate CC: Finishing Touches. Please be sure to view the courses in order if you are new to the material.